American Wholesale Property: Here is a non-MLS deal in Houston that is an excellent opporunity for an investor to make money! 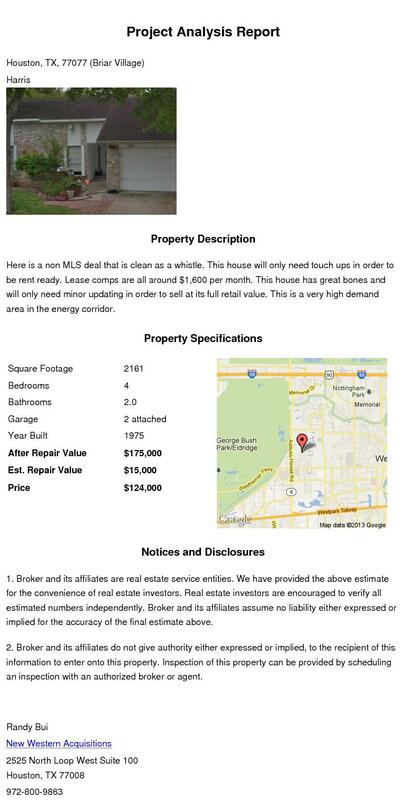 Here is a non-MLS deal in Houston that is an excellent opporunity for an investor to make money! Here is a non MLS deal that is clean as a whistle. This house will only need touch ups in order to be rent ready. Lease comps are all around $1,600 per month. This house has great bones and will only need minor updating in order to sell at its full retail value. This is a very high demand area in the energy corridor. For more details, contact RANDY BUI at randy.bui@newwestern.com; 972-800-9863.